Security is tight so are the roads! We left Kutch on Monday afternoon for a flight to Mumbai. We were caught up in a security nightmare as they made us check our two carry-ons and only carry one bag on the plane. As international passengers, there are usually many concessions made, but not on Monday. No makeup, lipstick gels, etc. They did let us carry on our laptops and cameras, but that will not be the case as we head to Afghanistan on Saturday. We are having to leave much of our luggage in India and get it back on the way to Nairobi. This is not a great time to be on this “World Tour”, but fortunately we do feel safe. 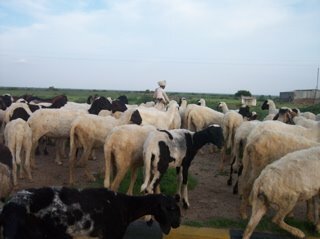 The roads are filled with cars, trucks, auto rickshaws, cows, water buffalo, shepherds and sheep. Makes the rides full of surprises and uncontrollable honking. After the flight to Mumbai, we took a four and a half hour car ride through the rainy mountain roads to Pune to see other friends who are running a card making group. Just as on a car drive in the US, we were thrilled to see the golden arches as we were ready for a clean rest stop. In India that is a rare treat. As we read the menu board we laughed at the Chiken Tika burgers and Maharaja Mac. Thank goodness french fries are the same everywhere!! We are here for two days and heading back to Mumbai for meetings with several handcraft groups and our Exporter who consolidates our shipments. I will be doing a training for their designers on trends and colors that impact 2007 and 2008 designs.